What Is the Cache River State Natural Area? The Cache River State Natural Area is an absolutely stunning example of a well restored wetlands area. You will find this gem nestled within afloodplain, which was sculpted by the mighty flood waters of the OhioRiver ages ago. The Cache River Wetlands is now fed by the Cache Riverand it's many tributaries and stretches over 14,960 acres in Johnson,Massac, and Pulaski counties in Southern Illinois. This scenic area also plays as a featured stop to many migratory bird species, including bald eagles, great blue herons and (a personal favorite) snowy egrets. Inaddition to the myriad of migratory birds you will undoubtedly catch anearful of the areas most vocal inhabitants as choirs of spring peepers,bullfrogs, bird-voiced tree frogs, American toads and more amphibiansall sing together from the bogs to the boughs and everywhere in between. As you hike on the trails and boardwalks below you may also want tokeep a keen eye trained for some of the larger warm blooded residents as many white tailed deer, squirrels, raccoon, beavers, foxes and minkcall the area home as well. A Short Trail, Big On Visuals! Beyond the wildlife that inhabits the Cache River State Natural Area, the area also boasts some truly spectacular plant life. 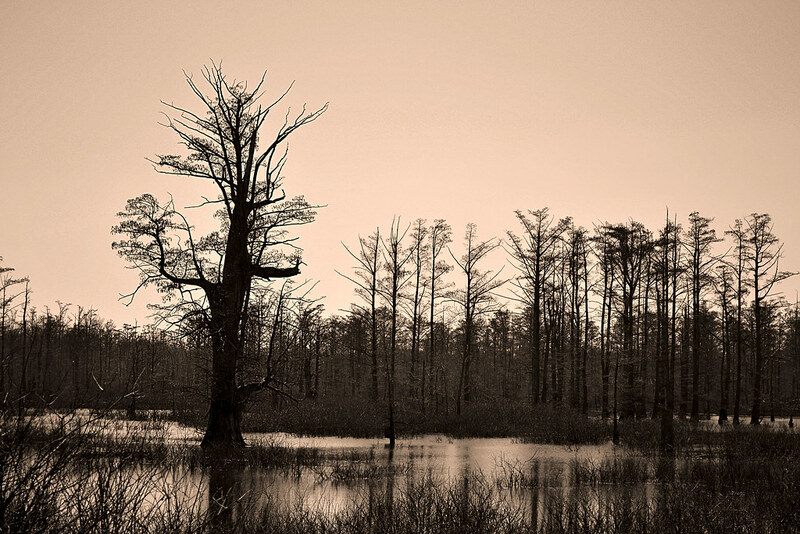 Throughout the area you will discover ancient cypress trees with their flared bases and many "knees", which were mere saplings over 1,000 years ago, now standing sentinel over the rich, black-water swamps that still nourish them. On the short, 250 foot Big Cypress Tree Trail you will find one very special bald cypress. This particular cypress tree has been so nourished by the rich waters that it has developed a remarkable base (also referred to as a buttress) of over 40 feet in circumference and towers over 73 feet tall, which has earned it recognition as a state champion. As you make your way to the enormous namesake of this trail over the pavement, be sure to take note of the other plants such as majestic tupelo trees and low lying thickets of button-bush that share the landscape with the silent cypress colossus. You may even catch sight of some fellow nature lovers out paddling among the giant trees. Many come to the area and take paddling tours, which offer additional advantages here in the wetlands. There are local businesses that can even take you on a guided tour of these impressive swamps! Cache River State Natural Area: Section 8 Nature Preserve Boardwalk -Take a stroll directly through a swamp without even getting your feetwet!